In 1967, Andy Warhol’s silkscreens were exhibited for the first time in Japan. 29-year-old Daido Moriyama showed an immediate interest for this crafty technique, which he saw as an obvious extension of photography. Daido Moriyama’s first silkscreen dates back to 1969. It was made for the cover of the photo magazine “Asahi Camera”. 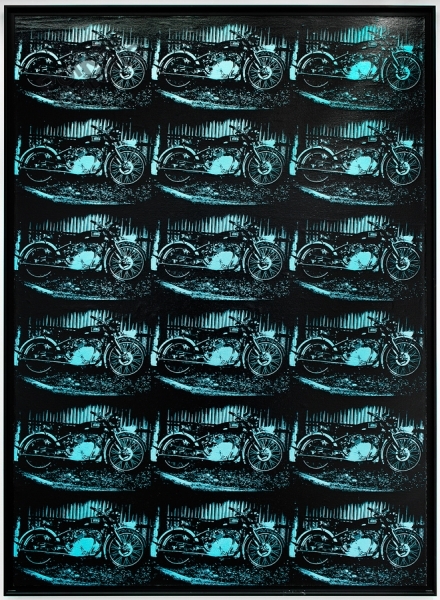 In 1974, he organized his first exhibition of silkscreens called “Harley Davidson”, showing six large-scale pieces in Tokyo. The same year, Daido Moriyama also convened his first “printing show” where contenders were invited to compose their own version of the book “Another Country in New-York”, printed on a Canon U-Bix printer. They then chose between two covers silk-screened on the spot by the photographer. In 1975, for the “Ouka” (Cherry flower) exhibition Daido Moriyama printed a paper silkscreen image of this flower. Yet, it is only in 2007 that Daido Moriyama decided to use once again the silkscreen technique on canvas to produce exclusive editions of large masterpieces. Twenty of these silkscreens are exhibited for the first timeat Polka Galerie. Next Americans can also suffer from Paris Syndrome!